Bring your jewelry creations to "light!" 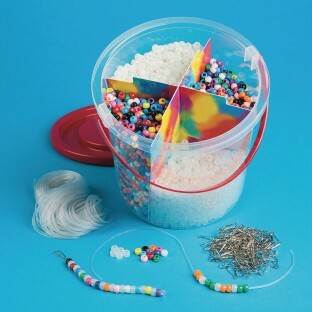 Includes everything to create colorful jewelry and lanyards that glow in the dark. Packed in an easy-to-store bucket. Glow beads illuminate in any darkened environment. Includes 2.5 lbs. of assorted color 6 x 9mm pony beads, 2 lbs. Bring your jewelry creations to "light!" This Easy Pack provides everything you need to create colorful, unique jewelry and lanyards that glow in the dark, too - all packed in our easy-to-store bucket! Mix the glow beads with the colored pony beads and watch as the glow beads illuminate in any darkened environment. Includes 2.5 lbs. of assorted color 6 x 9mm pony beads, 2 lbs. of glow-in-the-dark 6 x 9mm pony beads, 100' of easy to string and knot pony bead lacing and 144 lanyard hooks! Our convenient portable, stackable, refillable storage bucket includes a divider to separate all of the contents. Take-along crafting has never been more convenient!